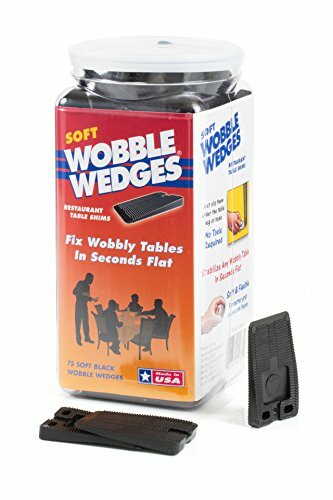 Made from durable and highly flexible black vinyl, these Wobble Wedge Soft Blacks have been devised to fix any wobbling furniture in a matter of seconds. Their application does not require any tools and they can be conveniently cut down to the required size with help of a knife or scissor. 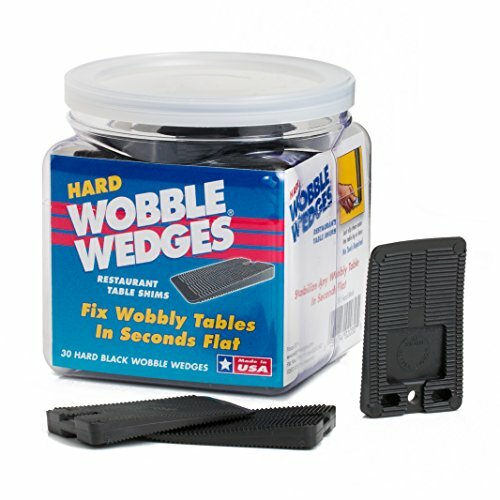 Stackable and able to interlock, the Wobble Wedges Soft Blacks can create a firm grip on any slippery surface. They also minimize squeaking sound caused by dragging of chairs and stools. 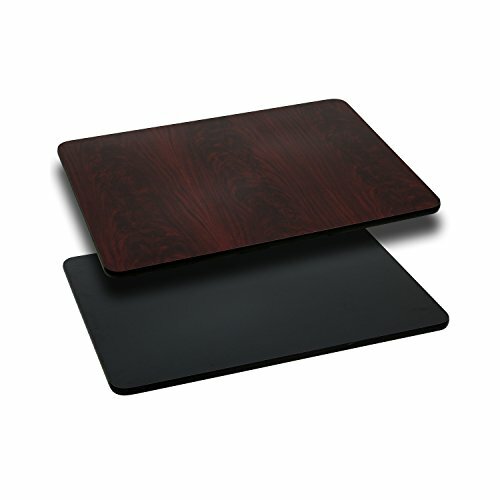 SOFT TEXTURE: Wobble Wedges have a rubber type texture, which creates a firm, non-slip grip to the furniture and floor. 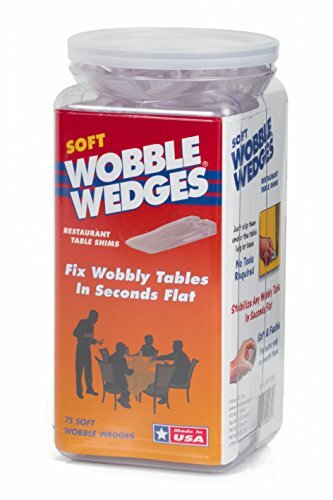 CUTS TO SIZE EASILY: Vinyl Wobble Wedges can be cut down to appropriate size easily with scissors or a utility knife. UNEVEN FLOORS? This product is excellent for areas where adjustments are needed. Simply place the wedge under the leg or foot that does not meet the floor to create a more even surface for your furniture. 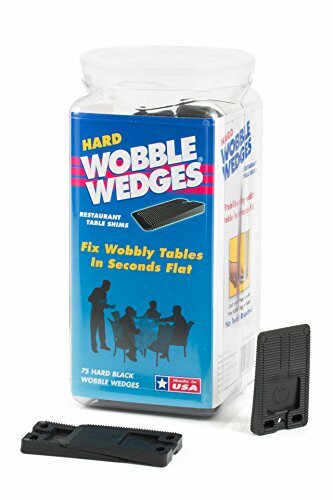 STACKABLE: Wobble Wedges can be stacked together to create a higher wedge if necessary. Stackable, pliable for really big wobbles. May be trimmed. 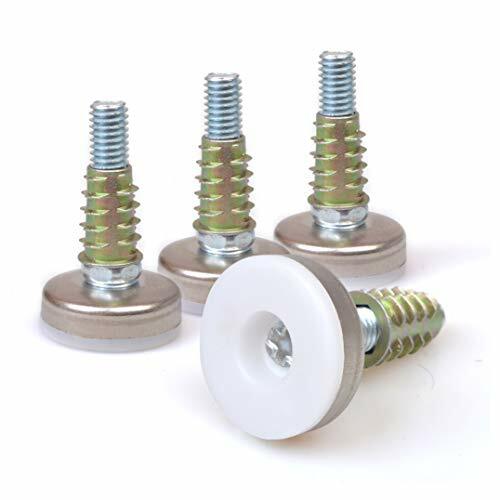 High quality felt bottom adjustable leveler feet protects your floor surfaces while providing you the ability to adjust the table and chair levelers height to fix wobbly or uneven legs on chairs or furniture. 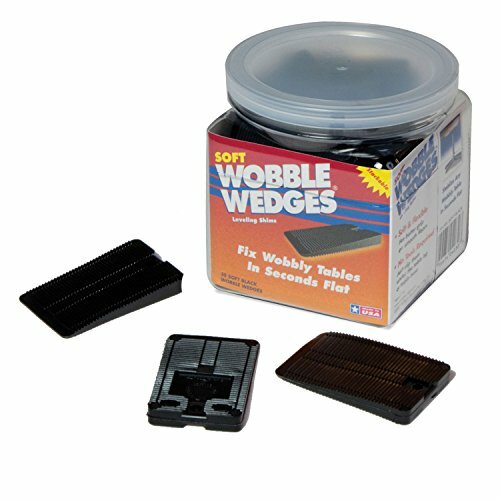 Eliminate the wobble and protect your floor with a quiet sliding felt foot. Adjustable legs help when the floor is unlevel or sloping, you can adjust the furniture to sit level on uneven floors. Threads on the screw are 0.35 inch 1.5 inch and can possibly be used as replacement feet in furniture since many manufacturers use that thread size. However, if your existing thread is different or if there is no hole in the furniture then we include a 0.35 inch 1.5 inch teeth prong nut that can be inserted into wood to create the proper screw hole. ORDER YOUR NICO'S FURNITURES LEG LEVELERS NOW!!! 100% SATISFACTION GUARANTEE : If you don't love our Nico Leg levelers - please return for a 100% refund. STOP BALANCING YOUR CHAIR AND TABLE LEGS WITH FOLDED CARDBOARD! 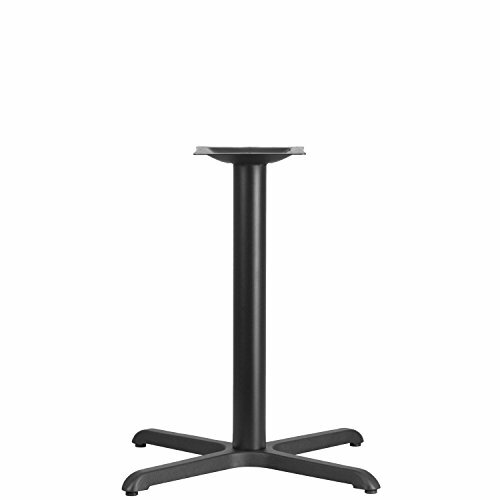 - Our Tables and Chairs levelers are the best way to quickly and easily fixing the level of all types of furniture at Home, Office, School, Restaurant. MODERN DESIGN will have people wondering if you bought a whole new furniture set. EASY INSTALLATION & FITS TO ALL FURNITURES Why buying new table or chair from the shop when you can use our Clear Style levelers pads to renew your furniture's at home.our materials are the best material for heavy duty use, very simple and quick installation to finish up your unbalanced. 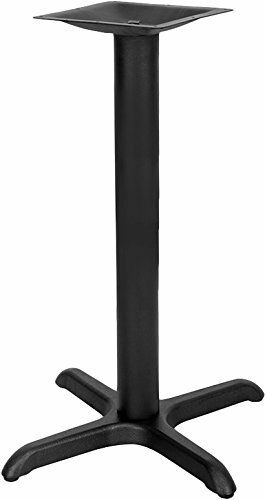 STRONG & STURDY COMMERCIAL QUALITY - These furniture levelers are the strongest on the market and 100% guaranteed to resist and bending or flexing under load. 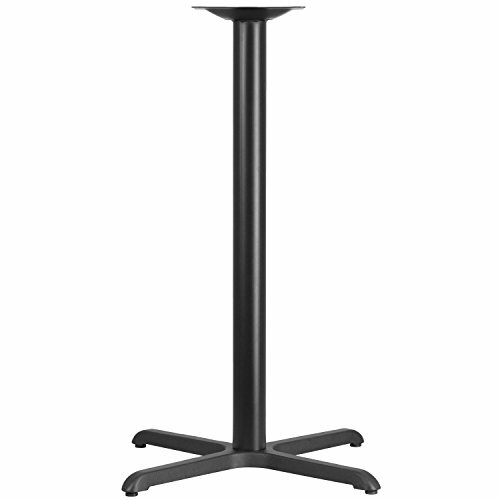 Made of 100% Solid Steel and Thick High-Density nylon base. 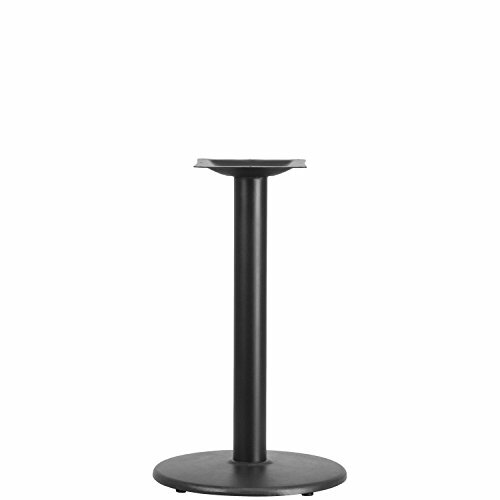 Sturdy 1.57 base Diameter and Fully adjustable 2.95 thread for maximum support and adjustability. 100% MONEY BACK GUARANTEE NO QUESTIONS ASKED - Our customers are #1 priority. If you are not 100% satisfied with your purchase, return it for a full refun!! ORDER NOW!! Focus 12 wobble wedges, hard, natural, 30 precision engineered tapered shims supporting over 2000 lbs five columns of offset ridges on both sides insure they are securely stackable and will not slip, or twist apart under load level, stabilize, tighten or silence anything that wobbles, tilts or rattles use for stabilizing and leveling tables, bookshelves, appliances, fountains, counter tops, cabinets and more stack them flat or at an angle to fill any gap size lwh: 1 inch x 11/4 inch x 1/4 inch securely stackable powerful no slip grip grab bar for easy retrieval won't shrink or swell precision ADJUSTMENT grid this product is manufactured in United States. Stop getting hurt moving washing machines, dressers, or other heavy home appliances you need to interchange throughout your house with the help of Stalwarts mobile dolly roller. 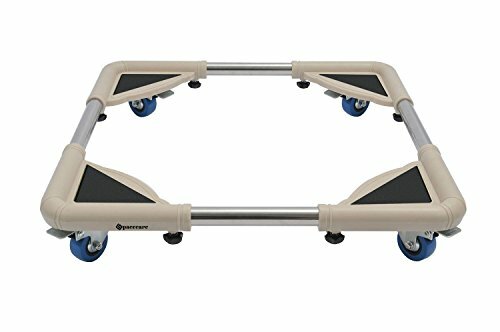 This adjustable furniture rolling dolly will help you easily push any heavy-duty home d cor across your wood floors with a simple push of your hand. IMPORTANT: Avoid buying counterfeit products and transacting with unauthorized sellers. Look for our logo on the packaging for every one of our products. Stalwart is committed to providing the consumer with the absolute best price and value on all our products, which we ensure by applying a rigorous Quality Control process. Stalwart is a registered trademark protected by U.S. Trademark law and will be vigorously defended. ADJUSTABLE CARRYING SIZE- Not all items that you need to move are going to be the same size. Being able to adjust down to 21" x 21", you can effortlessly roll a wide variety of items through your house on this portable push dolly. DURABLE BUILD- Built with sturdy PVC pieces and stainless-steel poles, this dolly has a weight limit of a hefty 220 pounds, making moving large furniture or appliances like washing machines and dressers fast and effortless. ROLLABLE CART- Sitting on top of 4 rubber swivel wheels, this dolly roller can be moved across any smooth flooring with little effort. When you want the cart to stay still, two wheels lock with a flip of a switch to ensure the dolly won't move unexpectedly. 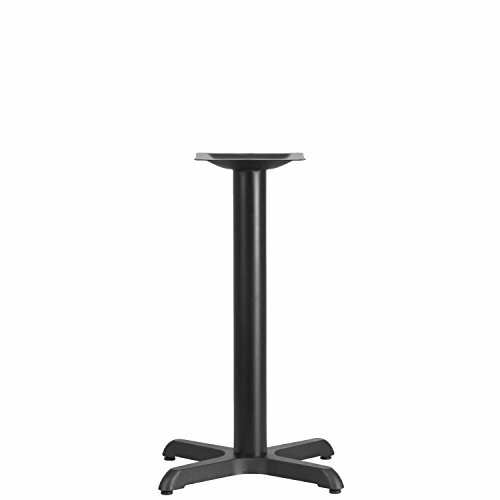 PRODUCT DETAILS- Dimensions: Maximum, 31 (W) x 31 (L) x 3.75 (H). Minimum, 21 (W) x 21 (L) x 3.75 (H). Weight Limit: 220 pounds. Includes: 4 Rubber Swivel Wheels, Two Locking Wheels, 4 Sturdy PVC Corner Pieces, 4 Sturdy Stainless-Steel Poles, and 1 Tape Measurer. SATISFACTION GUARANTEED- Stalwart is committed to providing consumers with the absolute best price and value on our entire line of products. NOTE: This is an exclusive product of Stalwart and ONLY Mobile Dolly by Stalwart are GUARANTEED to be genuine. Kit includes 1 gallon of Part A and 1 gallon of Part B, totaling TWO gallon kit. 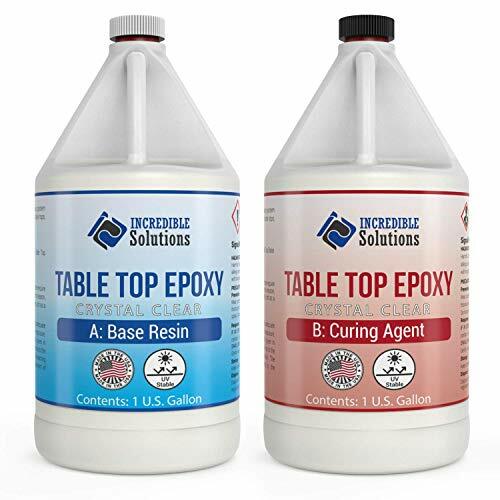 SELF LEVELING - Bar Top Epoxy self levels on application including corners, over bar rails and live edges. 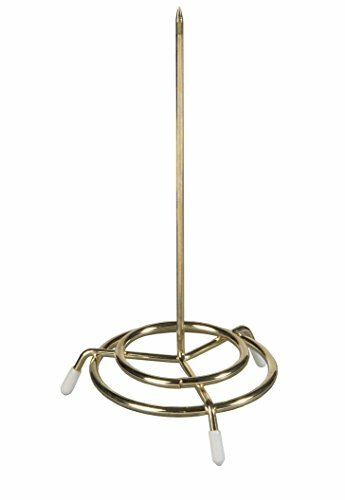 This brass-plated check spindle includes a rubber-capped tip to ensure employee safety. Sturdy brass plated wire. Measures 6-inch height by 3-inch width. Precision engineered tapered shims supporting over 2000 Lbs five columns of offset ridges on both sides insure they are securely stackable and will not slip, or twist apart under load level, stabilize, tighten or silence anything that wobbles, tilts or rattles use for stabilizing and leveling tables, bookshelves, appliances, fountains, counter tops, cabinets and more stack them flat or at an angle to fill any gap size lwh: 1 inch x 1-1/4 inch x 1/4 inch securely stackable powerful no-slip grip grabbar for easy retrieval won t shrink or swell precision ADJUSTMENT grid. 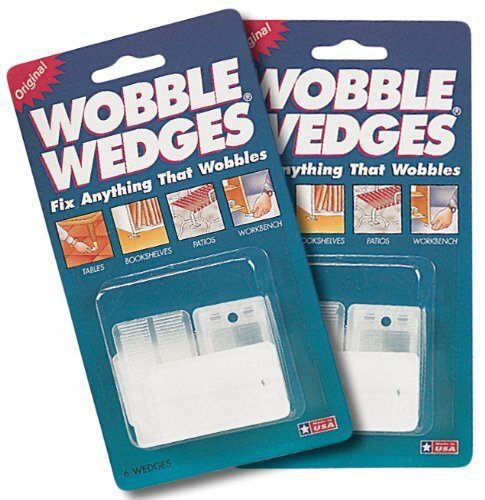 Fix anything that wobbles; level anything that tilts with Wobble Wedges. Set of twelve shims. Shims provide consistent expansive / stabilizing force when compressed between two surfaces. 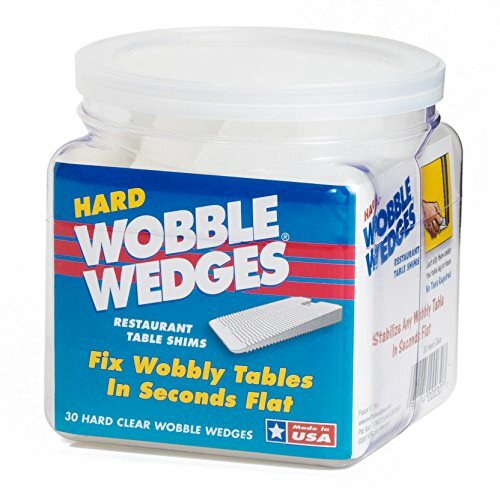 They're perfect for leveling plumbing fixtures, fountains and statuary, furniture and appliances - cabinets, shelving, workbenches, bookshelves, patio furniture, and herb and flower pots. Use them indoors or outdoors; use them to level nearly anything, anywhere. Brand: WOBBLE WEDGES | Manufacturer: Focus 12, Inc. 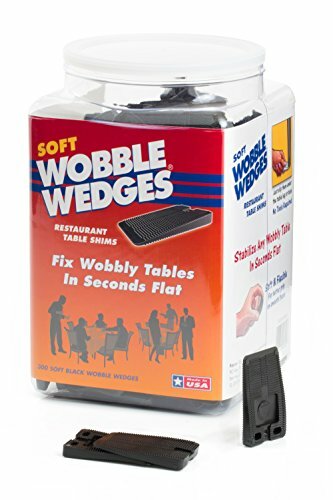 Fix anything that wobbles; level anything that tilts with Wobble Wedges. Shims provide consistent expansive / stabilizing force when compressed between two surfaces. They're perfect for leveling plumbing fixtures, fountains and statuary, furniture and appliances - cabinets, shelving, workbenches, bookshelves, patio furniture, and herb and flower pots. Use them indoors or outdoors; use them to level nearly anything, anywhere. Made of Polypropylene and made in the USA. Focus 12 wobble wedges, soft, clear, 75 precision engineered tapered shims with a rubberlike grip that easily conforms to uneven or curved shapes trim to fit with a scissors or utility knife five columns of offset ridges on both sides insure they are securely stackable and will not slip, or twist apart under load cushion, protect, level, stabilize, tighten or silence anything that wobbles, tilts or rattles use for stabilizing or installing wobbly toilets, appliances, glass panels and more works great as a self-cleaning glue spreader combine with hard wobble wedges to create a nonslip clamping pad on an Angled surface size lwh: 1 inch x 11/4 inch x 1/4 inch easy to trim securely stackable powerful no slip grip grab bar for easy retrieval won't shrink or swell cushions and protects this product is manufactured in United States. Stackable interlocking ridges for really big wobbles.